A Turkish court on Thursday sentenced pro-Kurdish politician Leyla Zana to 10 years in prison for “committing crimes on behalf of a terror group,” court officials said. She is expected to appeal the decision at the Supreme Court of Appeals. The Diyarbakır 5th Higher Criminal Court also revoked Zana’s right to vote and run for political office as well as other political rights. Zana was a potential candidate for a mayoral nomination from the Democratic Society Party (DTP) in the upcoming local elections in March. Zana and her lawyer, Fethi Gümüş, did not appear in court at yesterday’s session. Zana gained prominence in 1991 for taking part of her oath of office in Parliament in Kurdish, a language not recognized as an official language in Turkey. 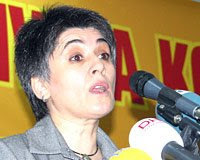 She was convicted in 1994 by the State Security Court (DGM) of links to the PKK, which is considered a terrorist group by Turkey, the United States and the European Union. In 2004, she was released after the appeals court overturned her conviction and that of three other Kurdish former lawmakers. PKK is u terrorist organization and responsible for the deaths of 40,000 people in Turkey.